As I write this, ES futures are down about 19 points, which does not in any way invalidate my preferred count; however it likely means I was early in marking sub-minuette wave i as complete. This opens up the potential that all we've seen so far is a nested series of 1-2's -- and depending on where wave i bottoms, there may finally be cause to lower our 1060 target. We'll have to see what the open brings. If you read my Weekend Update, you'll recall that I said I don't trade counter-trend during nested 3rd waves... this is another reason why. The waves are often so forcefully skewed in the direction of the trend that the minuette waves and smaller become hard to count, so trying to trade the small squiggles can be very hazardous to your wealth. 1) The current wave structure has stayed almost perfectly contained by the i-iii trendchannel (the large turquiose colored channel), which argues that it is all the same wave-form. 2) In this alternate count, wave iv would be a sharp correction and a simple a-b-c structure. You can see that wave ii was also a sharp a-b-c. This violates Elliott's Rule of Alteration, which states that corrections tend to alternate between simple and complex forms. This rule is not intended to be set in stone -- it is more of a very strong guideling -- so it can be violated without ripping apart the space-time continuum, but it is unusual nonetheless. 3) The physical time taken up by wave (2) is very short relative to the preceding wave. Wave (1) took 3 and a half months under this count; wave (2) would be about 2 weeks (although: the timeline would work better under the alternate count (on this chart) of w-x-y, which would stretch out the correction). Again, not a concrete rule, but another clue. 4) The preferred wave iv stays perfectly within the red channel, again arguing that it is all part of the same wave, as opposed to this alternate count which would have the red channel contain waves iv and v of minor (1), as well as all of minor (2). 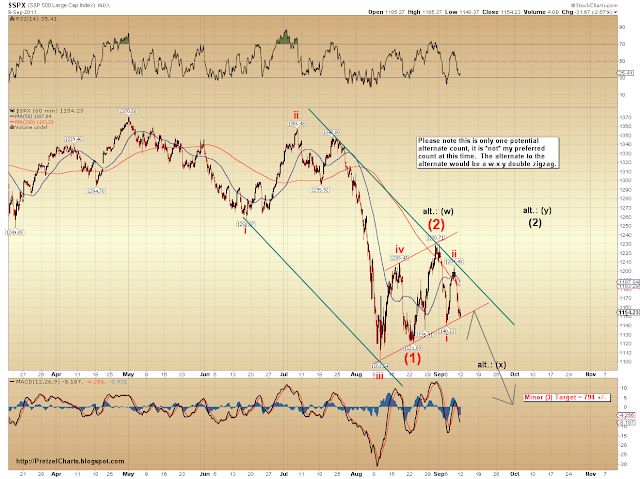 1) The wave labeled (1) in the chart counts very well as a five wave move. In fact, when it unfolded, my initial reaction was that it was a truncated fifth and that minor (1) had completed. 2) The decline off the high so far has been quite powerful. This is characteristic of a higher degree 3rd wave, much more so than it would be of a low-degree fifth wave (of 1). The trick here is that if my preferred master-count is correct, and this is a Supercycle C wave, then (I assume, anyway) none of us have ever traded in an environment this bearish, and moves are likely to surprise to the downside over and over again. Indicators which worked in prior bear markets as "buy" signals are likely to fail repeatedly. It wouldn't surprise me if a "Supercycle Minor (1) of C" is as powerful as a Minor 3rd wave in a "normal" bear market. 3) As I've pointed out in several previous posts, a large number of big-cap stocks look like they are completing, or have completed, 2nd wave retracements (Apple, for example). If Apple starts crashing in a minor 3rd wave, it's pretty hard to imagine that the SPX, Dow, and NDX are going to be trading in the green. 4) One word: "Plastics!" No, sorry, just a little Graduate humor there. Three words, actually: "Black Swan Event." In this environment, there lurk many potential crash-inducing events which could change alternate counts into preferred counts in the blink of an eye. So there you have it: both sides have been given equal airtime and the same number of bullet points. Ultimately, interpreting market moves is always up to the technician, and all good Elliotticians must weigh similar arguments many times each week to decide which count has the highest potential. Nobody can be right 100% of the time; but the successful technicians are humble and light on their feet, and able to evolve their counts as the market dictates. So... if there seem to be reasons to start favoring this count over my preferred count, I'll alert my readers immediately.